Our selection of clear braided PVC hose is available in 20ft, 100ft, 300ft, and 2400ft lengths. Many of our options for PVC braided reinforced hose are non-toxic and FDA-approved for use in USDA meat and poultry plants. 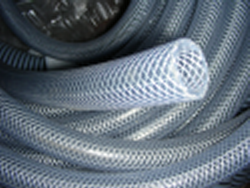 Find the hose you need at FlexPVC. This page is for clear braided hose by the roll. To buy less than roll lengths, you can buy clear braided hose by the foot here.